Old tug"ORION" with Skinner engines? I believe that the ABS is wrong on this one or you might be looking at the info for a different ORION but to answer your question a Skinner Uniflow steam engines, they were a double acting engine with all the cylinders the same size as opposed to a single acting triple expansion engine which was more common. Although possible they were used after WWII, the tugs I know of that had them were the 156’ Army LT series tugs that were built by the Marietta Manufacturing company at Pt. Pleasant, West Virgina. Almost all those tugs after the war were repowered with diesels and tlthough now almost 70 years old there still are a few still around on the Lakes I believe. Here’s a pic from the way, way back machine of one of these LT’s take on SF Bay in the early 80’s when still operating. Also the last operating Uniflow engines are on the ferry BADGER. btw, did I tell you that C.Captain loves this stuff! Still hoping before I kick off someday, to write a book about all these old timey vessels built in WWII. Simply amazing what the USA was able to do back then in 5 short years. Looks like is part of Martin operating partnership she was built in 1941. Here’s the ABS Record for the ORION you saw in Fourchon. Don’t know why but I recall a tug like the ORION working on the West Coast that had Fairbank Morse O/P’s in her. They sound kind of odd. Any idea who that is? I wonder where that tug is and if it is still operating. According to ABS is has a currently Load Line. Seems a whole load of these very old timers still on the Lakes. That seems to me the only place it could be? I belive you have the wrong Orion. http://www.martinmidstream.com/marine-transportation this is my guess. [QUOTE=c.captain;76197]I believe that the ABS is wrong on this one or you might be looking at the info for a different ORION but to answer your question a Skinner Uniflow steam engines, they were a double acting engine with all the cylinders the same size as opposed to a single acting triple expansion engine which was more common. Although possible they were used after WWII, the tugs I know of that had them were the 156’ Army LT series tugs that were built by the Marietta Manufacturing company at Pt. Pleasant, West Virgina. Almost all those tugs after the war were repowered with diesels and tlthough now almost 70 years old there still are a few still around on the Lakes I believe. Skinners compounds are single acting, HP power stroke is up, LP power stroke is down. Most all other piston steam engines are double acting. Double acting meaning steam is used on both sides of the piston, first on, then the other side. The Badger has compounds and I believe the St Mary’s Challenger has the simple Skinner. You are correct rshew, that is some of Martin gas transport boats. I think they have 3 or 4 ATB’s and about 15 inland tugs and barges. The ATB’s are old converted boats except the “POISDEN” which is one of the origianal blubworth boats built by Robert Bludworth himself. [QUOTE=ChiefRob;76216]You are correct rshew, that is some of Martin gas transport boats. I think they have 3 or 4 ATB’s and about 15 inland tugs and barges. The ATB’s are old converted boats except the “POISDEN” which is one of the origianal blubworth boats built by Robert Bludworth himself. Single acting triples were very rare and mostly were “high speed” enclosed crank engines. You are correct. I was First on the USNS [I]Myer[/I] sometime back in the mid 70’s, she was a cable vessel, twin screw, with two Skinners Unaflow (that’s how it was spelled by the builder) Engines. They worked like well maintained mechanical watches, the sound of the steam passing through the valves was a delight to hear, a soft hiss. The USNS [I]Myer[/I] steamed for 42 years, but the skinners were replaced by steam turbines sometime after my time aboard her. 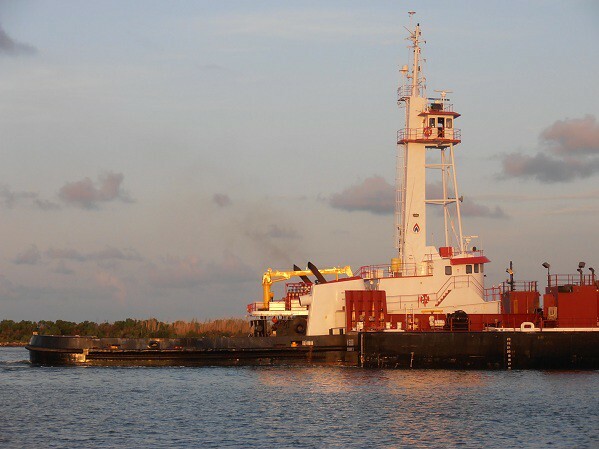 her captain said she has less downtime than the other offshore tugs owned by Martin and she 's a great handling tug. he also said she spent a good part of her career working the mouth of the Mississippi river as an assist tug for grounded ships. [QUOTE=Jim Schneider;76215]Skinners compounds are single acting, HP power stroke is up, LP power stroke is down. Most all other piston steam engines are double acting. Double acting meaning steam is used on both sides of the piston, first on, then the other side. I just look at Osbourne’s Modern Marine Manuals Second Addition and I see i am wrong about the Unaflow is double acting. The Compound Unaflow could be considered double acting as both HP and LP are on the same piston rod. The difference being that in the compound each piston only “works” on it’s power stroke and exhausts on the return. The Skinner shown in the video is a single acting compound engine. It is compound because the HP exhaust is expanded in the LP cylinder. It is single acting because steam “acts” on only one side of the pistons. Well I be damned…that’s for sure. Don’t look nothin like she did in her WWII days. Well, it’s a been a long time since you saw it in 1945 so you shouldn’t feel too bad. Thanks for digging up the info!